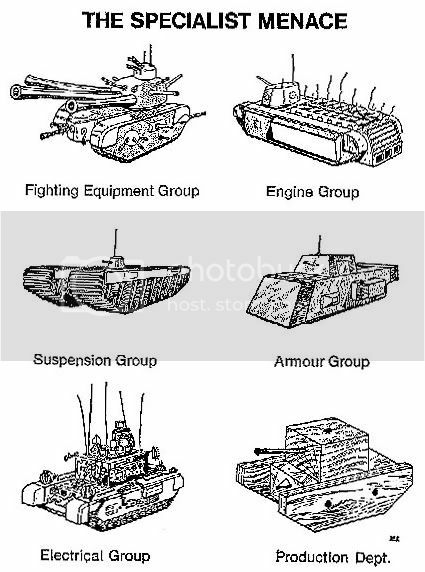 The Difficult World of British Armour Development. Discussion in 'Weapons, Technology & Equipment' started by von Poop, Aug 29, 2009. W.A.Robotham (Rm), who was for some time in charge of Rolls-Royce Experimental Department on the car side, wrote his autobiography "Silver Ghosts and Silver Dawn" (Constable 1970). During the Second World War when Rolls-Royce Car Division team was working on the design of the Cromwell tank, there was continuous conflict on Ministry specifications for tanks. He included this illustration originating in Vauxhall's at this time as "The Specialist Menace". Anyone that's read Fletcher's 'Mr Churchill's Tank' and been surprised at just how easily some passing 'specialist' could derail an entire project will no doubt understand the frustration of the original artist... each of those mould-breaking illustrations being rather 'Churchillesque'. canuck, Slipdigit and Bodston like this. Seen that before but where? One of the HMSO books they sell at Bovy ? Some good cartoons on the website. Bumping an old thread, as it made me smile. SDP and Seroster like this. Thank you for bumping it! It's very funny. a) Before Claude Gibb - general chaos. b) After Claude Gibb - a well oiled machine. Gibb should be a national hero (although he was actually an Australian), because once he took control in late 1943, the Ministry of Supply started to churn out quality machine after quality machine. He also conceived and largely designed the Centurion. The sad part is that he pretty much worked himself to death, having his first heart attack in 1947, and suffering debilitating illness until he died in 1959.
rick wedlock, canuck, von Poop and 1 other person like this. Said to have averaged two hours sleep per night! That would lead to an early demise. ozzy16 and Tolbooth like this. Yes, he had his first relapse in 1944. A lot of the key tank development engineers died young, or shortly after the war. For example, William Blagden died on the FVPE test course in 1947, and Robert Micklem died in 1955. It's why I tend to be a bit brutal when anyone comes out with the "British tank development was led by idiots" line. Whatever their errors, these guys worked like Trojans for the cause. Seroster, canuck and von Poop like this. It's why I tend to be a bit brutal when anyone comes out with the "British tank development was led by idiots" line. Whatever their errors, these guys worked like Trojans for the cause. Shouldn't need to be said, but nuance & detail often not an internet 'tank talk' strong point. I do think the balance is tipping somewhat, though. Becoming a little easier to find more considered development stuff, and finally other machines than Germany's are getting more useful books published. Albowie, Seroster, canuck and 1 other person like this. Very true. With the passage of time, nuance and context are usually the first things to fade into obscurity. I am no expert on this, but how much was late 30's and early war tank design in UK constrained by the road system and the lack of adequate transporters both road and rail. On another thread I was told that LMS and others had to design new transporters for the Sherman to go by rail in the UK. Elsewhere I read that road tank transporters adequate for the 40te plus tanks were designed in the US or many had to be built there. So were our designers working with an arm behind their backs to some degree, let alone the 2/6/17 pounder gun development. I am not making any point especially, just asking a question. If its addressed elsewhere, I haven't looked hard enough. The most important thing that W.A. Robotham did was institute the 3000 mile durability test. He should get enormous credit for this. he also brought in Rolls Royce R & D techniques. these worked wonders in the cooling system and helped to reduce the failure/rejection rate of the the christie coil spring assembly. Oliver Lucas also died in 1948, at age 56. I have a question about Lucas. He was Director General of Fighting Vehicles (R&D). Would he have liaised between multiple companies? To what extent then did Joseph Lucas and Sons carry out the R&D work he was responsible for? And also I'm curious as to how much staff each of these men had available to them within the MoS. C.A.F.V. was the Chairman of the Armoured Fighting Vehicle Division (if I have that right?) of the MoS but how big was that? Oliver Lucas was initially the Controller General of Research and Development (CGRD) from approximately Oct-Nov. 1941. He reported directly to the Minister of Supply, and had underneath him the Chief Engineer of Tank Design (CETD), W.A. Robotham. They had a staff within the Ministry of Supply, and also controlled the DTD at Farnborough (which later moved to Chobham). In September 1942, the Ministry of Supply formed a dedicated AFV Division under Robert Micklem as CAFV, with Lucas serving as the Director-General of Fighting Vehicles (Research and Development), or DGFV(R&D),under Micklem. I think this was a demotion really, but I'm not able to confirm this. W.A. Robotham remained as CETD. The pair were then both turfed out when Claude Gibb took over the role of DGFV(R&D) in August 1943. Gibb then effectively took over the whole AFV Division when he became DGAFV in January 1944, although Micklem carried on as CAFV as a figurehead until November 1944. The whole Ministry of Supply tank development apparatus would have liaised with the various companies undertaking tank development. As for personnel, that's difficulty to estimate, but the AFV Division mushroomed in size as the war progressed.